The AI-5120 is designed primarily to monitor and analyze signals present on the telephone line. A key application is trouble shooting and debugging fixed line SMS (Short Message Service) and Caller ID signals. By detecting and recording FSK or DTMF signals, it allows users to view and analyze the waveforms for potential problems. 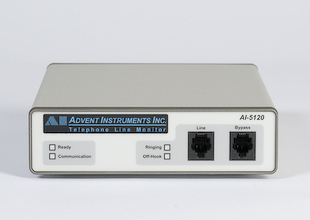 Unlike an oscilloscope, it automatically triggers on events specific to telephony. These include hook switch transitions, DTMF signals, CAS/DTAS signals, or FSK signals. As a line monitor, the AI-5120 does not go off-hook (seize the line), or generate tones. It bridges the line with a very high impedance and only listens. The high impedance prevents the AI-5120 from disturbing signal levels present on the telephone line. The included TRsSim PC software provides a high level graphical user interface for controlling the AI-5120. As events are detected, the software displays timing and measurement information. Additionally, waveforms for each event may be recorded for display and further analysis. Waveforms can be played back to the AI-5120's BNC monitor or speaker out, or exported as wave files for analysis using external software packages. Any signals present on the telephone line may be routed to the AI-5120's rear panel BNC output connector or the speaker jack. This provides a simple means to pass signals to external equipment requiring an unbalanced input. A wide range of programmable filters can be inserted into the signal path helping to reject unwanted signals and isolating the desired signals. Also available on the rear panel of the AI-5120 is a digital I/O connector. The three digital outputs can be used to notify external equipment when the telephone line enters the off-hook state, when ringing is detected, and the decoded bit pattern from detected FSK signals. 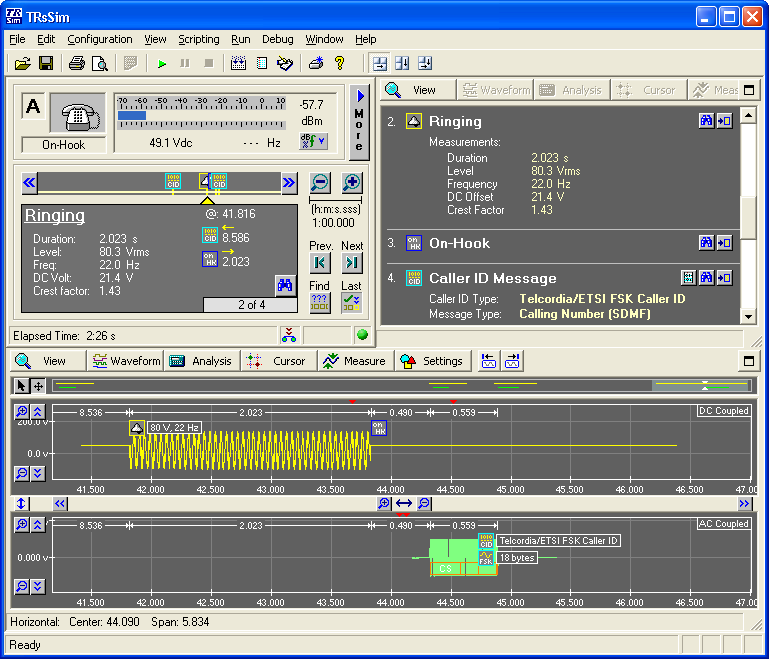 By using the two digital inputs, external equipment can trigger the TRsSim software to record signals present on the telephone line. 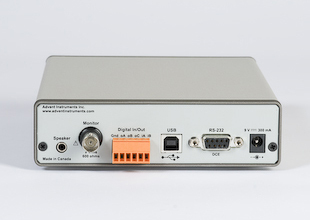 The optional Instrument Suite software converts the AI-5120 into a spectrum analyzer and digital storage oscilloscope. The spectrum analyzer operates over a 35 kHz bandwidth with features such as variable span, peak hold, averaging, and cursor measurements. The DSO portion of the software supports up to a 5 second memory depth in addition to programmable triggers, filters, and cursors. The AI-5120 connects to the PC via either a full speed (12 Mbit/s) USB 2.0 interface, or a legacy RS-232 communications port. Windows 2000, XP, or Vista is required to operate the TRsSim software or the Instrument Suite software.